What damages can I get when I sue under FCRA for false credit reporting? 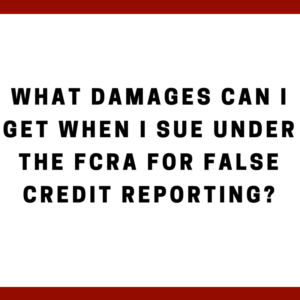 What damages can I get when I sue under the FCRA for false credit reporting? When you have a company (or companies) violate the Fair Credit Reporting Act (FCRA), you can get money damages but there are some twists and turns to it. So you have an error on your credit reports. What do you do next? [Note: I’m ignoring the FDCPA (Fair Debt Collection Practices Act) which deals with debt collectors — including credit report errors by debt collectors. We’ll keep this focused solely on the FCRA]. You cannot sue without first disputing the false information through the credit reporting agencies (Equifax, Experian, Innovis, SageStream, TransUnion, etc). If it gets fixed after your first dispute, that’s the end of the matter under the FCRA. But if it does not get fixed, and if the law has been violated, then you can sue. So let’s use a quick example of a paid off debt. This happens a lot, especially for folks who are looking to buy a house. You owed Capital One $4,000. You end up settling with Capital One (or whoever) for $3,000. So how much do you owe? But Capital One lists you as owing $1,000 (the difference in $4,000 and the $3,000 payment). So you dispute this through the credit reporting agencies. They verify it — which means it is not being changed to a Zero balance. Since this is false information and you did a proper dispute, you can sue under the FCRA. We will focus this article on suing Capital One but it is also the same for suing the credit reporting agencies. Having Capital One keep false information on you — even after you disputed — is incredibly frustrating. So it is natural this will cause you mental anguish. How frustrating to have a large company just refuse to fix the problem in a such a high handed way. They settled with you but now they want to change the deal and blackmail you into paying them more money. So you could and would make a claim for mental anguish damages to compensate you for your frustration and what they put you through. It is also natural this could cost you money in terms of higher interest rate or being rejected for a home loan. You can also recover damages for any monetary loss. So you pay more for your home mortgage — that would be damages. You lose a job due to the credit reporting by Capital One — that can be damages. Point is you can be compensated for both monetary and non monetary damages. If the bad conduct of the defendant was intentional or reckless, then you may can get punitive damages under the FCRA. So the first one is simply to punish. Someone cheats you or intentionally hurts you, they need to be punished. The second one is to send a message to all companies who credit report — do not break the FCRA or you will face punitive damages. Like punitive damages, the statutory damages are designed to be used when the defendant (Capital One in our example) intentionally harms you or intentionally breaks the law. You can get up to $1,000 per violation of the law. This is so even if you were not hurt (compensatory damages), you can receive monetary damages. It is to provide you an incentive to bring suit. Why would the law encourage you to bring a lawsuit? Because the federal government knows it can’t police all of these companies who break the law. So it encourages consumers to bring lawsuits to help clean up the industry. Another way the law encourages you to bring suit is the company you sue may have to pay your attorney fees. This makes it easy for you to sue because your lawyer will be paid for by the bad guys. Ironic isn’t it — they break the law and have to pay you, pay their own lawyers, and pay your lawyers. This is to encourage you to bring suit and to encourage companies to do the right thing — simply follow the law. Let’s talk a minute about when damages can begin. The FCRA says you only get damages after you dispute and the bad information is not fixed. Not the damages that you suffered before you disputed it. Like anything there are exceptions but this is the basic concept. This is not anything to stress over, but you do need to understand this as you and your lawyer calculate your damages. We often see consumers who don’t understand this bizarre way to figure damages and it can cause confusion. We can work with the law to get you full compensation but just keep this in the back of your mind that there is this unusual starting point for FCRA damages. [Note — this is different than other laws including the FDCPA]. If you live in Alabama, we are happy to talk to you about your situation and see how we can help you answer all of your questions. Give us a call at 205-879-2447 or fill out our contact form and we will be happy to help you. CACH LLC purchased my credit card debt in 2008. They name a bank I’ve never done business with ( Maryland bank) as the original creditor. I told them to prove the debt and they sent a reassignment letter from Bank of America (correct original creditor). Every 1-3 years a different attorney or agency writes to me trying to collect. I disputed the amount as it has increased by more than $1,000. No one representing CACH ever responded to the disputed amount. Except for placing an “investigating” notation under IBM credit union. IBMCU actually provided the credit card but BofA was the card issuer. I contacted the collections manager at IBMCU who said they themselves have no business relationship with me and did not place that notation on my credit file. Note: I had never received a response to my dispute 3 years ago. CACH has chosen to not sue me since 2008 and this debt has passed the SOL. CACH also began addressing me by a different name, adding a Margaret as a middle name. I wrote to them saying this isn’t my name and to address me correctly. They submitted this conjured up name to the credit reporting agencies, though I don’t know how as the bad debt no longer was on my credit report. Can I sue them? Whether you can sue CACH or any of the collectors CACH hires is a complicated question. Let me give you some thoughts. If you dispute to a debt collector (and CACH is considered a collector as this is their main business — collecting debts), then the collector needs to respond or do no further collection. But they can sell or assign or transfer the debt. A debt should not be on your report — talking about negative debts — more than 7 years after the first major delinquency. Typically 6 months of not paying. So if you defaulted in 2008, this should not be on your reports. I’m not clear if it is CACH or First National Collections Bureau reporting on you. Get with a consumer protection attorney in your state. Lay out the timeline of everything that has happened and include the documents. So the collection letters, the dispute letters, the credit reports, etc. For example, does your credit report show this debt is disputed? Does the collection letter you just received tell you it is too late to sue you? Does it warn you that if you pay, you may restart the statute of limitations? There are options and it really depends on exactly what has happened so get you some good advice. If you are in Alabama call us at 205-879-2447 if you want to chat with us. I paid off a loan with Wells Fargo early with no late payments and they reported to Eqifax only that I was delinquent of the pay off amount ($3592.00 – Feb. 2018). This error in reporting lowered my FICO score 42 points or 10 years of my good credit. Wells Fargo says it was a mistake and after I disputed the amount with Wells Fargo and Eqifax they did correct the error. I had an 831 FICO score for many years and after paying off this loan my FICO score went down 42 points to 789. I have been with Wells Fargo for almost 30 years and paid of many loans including home loans. With all depute corrected my FICO score still remains under 800. Is there anything I can do to retain my original FICO score? Is this something I can sue for punitive and/or statutory damages for? Under the FCRA it is almost always required that you dispute first, and then ONLY if the false information is not corrected can you sue under the FCRA. Sounds like it was fixed but your score has not returned. Were there other changes? Were credit limits lowered as a result of Wells Fargo error? That could lower your score also. I would pull your report now and compare it to how your report was before the WF error — see if you can find any differences. It might be you had some other consequences to the WF error and by contacting those companies showing them WF made an error (wouldn’t be the first time for those geniuses at Wells Fargo!!) they might put things back the way they were. Hope you can get this fixed ASAP! I’ve been trying to get Nissan-Motor/Infiniti Corp (NM/IC) to correct a credit reporting error for three months now. I was leasing a vehicle and was contacted by the dealership in Jan 2019 to do an early-trade, to which I agreed to. Well after all the paperwork & agreements with NM/IC (completed end of Jan 2019), I discovered they reported me late for both the month of Jan 2019 & Feb 2019, thereby causing me to drop significantly in credit score which has resulted in the loss of my ability to qualify for financing on my new home (I was simultaneously trying to buy a home at the time and informed the dealership that this absolutely could not interfere with that process, they assured me it would not and even notated it on my financial account with NM/IC to which they also agreed). I’ve disputed all of this with all 3 credit bureaus, and we’re told until NM/IC sends corrections, the bureaus cant just auto-update. I’ve had numerous phone conversations with NM/IC; they addressed the Jan 2019 late, but still will not send anything regarding the Feb 2019 late error being reported. Again, this is affecting my livelihood altogether & my children & I need to find a home… Do I have a case to sue NM/IC and the bureaus? I live in Alabama. I appreciate any help you can provide. Please call us at 205-879-2447 and ask for Randi. Short answer is we need to see what they do with the disputes — do they fix this or keep it? Be glad to walk you through your options.